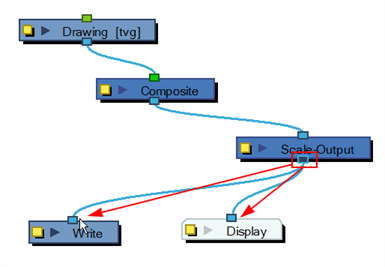 Once your Write nodes are connected, you need some Scale-Output nodes to change the resolution output of the Write node without changing the scene settings. For example, if you export in a high resolution and a low resolution, you need one Scale-Output node. Set the project’s resolution to the highest resolution needed for this export and use the Scale-Output nodes to scale down the other outputs. DO NOT scale up the output size, that will not provide a good result. It is also better to use the Scale-Output node to scale down in a same aspect ratio so that it does not distort the image. To learn how to use the Scale-output node, see About Multiple Renders. Find below the Scale-Output node properties. Resolution Name Select one of the existing resolution preset from the list to indicate the resolution you want the finale images to be scaled at. Always make sure the selected resolution is smaller than the scene setting one. 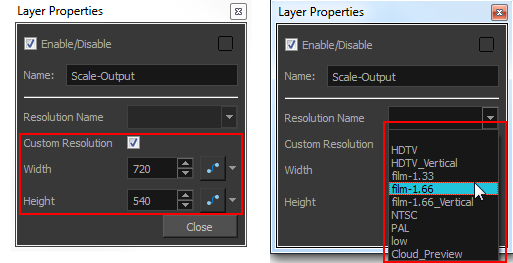 Custom Resolution Enable this option to set a resolution that is not available in the Resolution preset list. Width X (horizontal) value in pixel of the resolution to scale the images down to. Height Y (vertical) value in pixel of the resolution to scale the images down to.